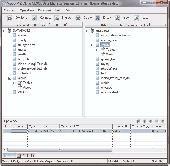 Viobo MSSQL to MySQL Converter convertes data between databases easily. The user-friendly interfase, convertion and backup make batch data operations simple. It supports all versions of MSSQL and MySQL, supports both oledb and odbc database provider. MSSQL to MySQL database conversion tool automatically convert individual or complete database table's record from Microsoft SQL server to MySQL database server. Software support all MSSQL data types and null key, primary key, foreign key constraints. MSSQL<->MySQL converter can be described as MS SQL to MySQL converter and MySQL to MS SQL converter in one program but Why MSSQL<->MySQL converter is better. Viobo MSSQL to MySQL Data Migrator tool is the simplest data-migrator between MSSQL and MySQL currently. Moreover the tool supports both oledb and odbc database provider. Download freeware database converter migrate MSSQL records to MySQL, comprehensive solution to transfer required database tables records to MySQL Server 2000. MSSQL to MySQL database converter is non destructive and cost effective database transformation tool which easily convert bulk database records created in Microsoft SQL database to MySQL database server in few minutes. Download MSSQL to MySQL comprehensive database conversion solution which converts MySQL databases to MSSQL server with all attribute such as entire database, data type, trigger, null value, selected rows and column and primary keys etc. MSSQL database converter tool converts MSSQL to MySQL database format. Microsoft SQL server 2000 to MySQL database converter software converts table? MSSQL to MySQL DB transformation software redesign table schemas during database migration and modifies small, medium and bulk size of data. Smart database convertor can migrate Microsoft SQL server to MySQL database by making new record or overwrites on existing MySQL database.